Saturday the 25th of March 2017 was an extraordinary milestone in the history of Africa University as hundreds of the institution's students, staff, friends and partners came together to celebrate 25 years of nurturing global leaders. This day marked the culmination of the official celebrations which took place on the institution's main campus in Mutare, Zimbabwe. Amongst the distinguished guests in attendance was the Chancellor of Africa University, Bishop David Yemba, Resident Bishop of the Zimbabwe Episcopal Area of the United Methodist Church, Bishop Eben Nhiwatiwa, Chief of the Mutasa catchment area in Mutare, Mambo Mutasa, Members of the Board of Directors for Africa University, Minister of State for Provincial Affairs for Manicaland Province, Hon. Mandiitawepi Chimene, Permanent Secretary of the Ministy of Higher and Tertiary Education, Science and Technology Development, Ambassador Dr. Machivenyika Mapuranga, Charge d’ Affaires, Mrs. Jenifer Savage representing the Ambassador of the United States of America (USA) to the Republic of Zimbabwe his excellency, Ambassador Harry K. Thomas, Jr., the Secretary General of the General Board of Higher Education and Ministry (GBHEM), Rev Dr. Kim Cape and the entire GBHEM Board of Directors. 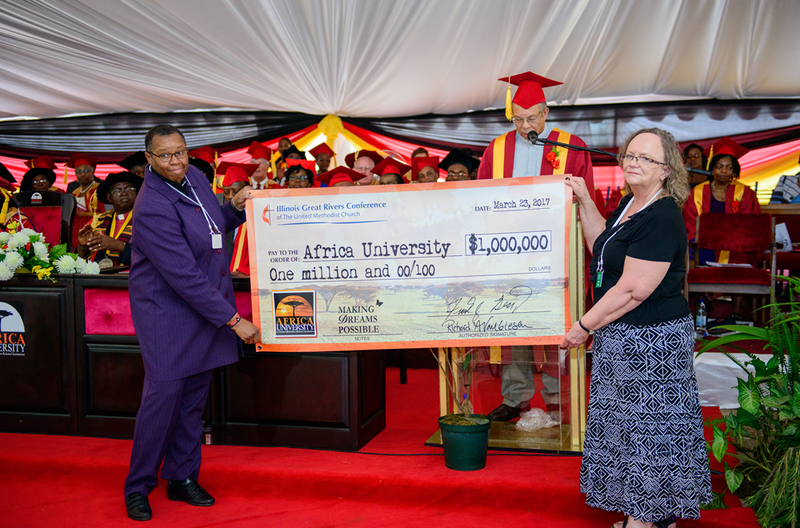 A special graduation ceremony to confer two honorary degrees took place during the celebrations and were inducted into the 7 000+ network of AU alumni. 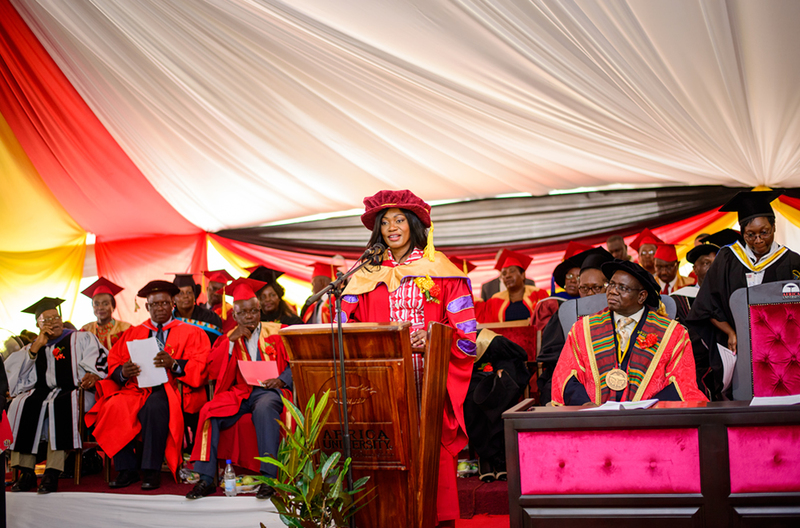 Mrs. Tsitsi H. Masiyiwa, a global philanthropist was awarded the Honorary Doctor of Social Welfare (Honoris Causa) for outstanding contributions to the empowerment of less privileged young people in Africa and leadership in the technological renaissance of youth around the world. Rev. Dr. James L. Waits, renowned theologian, former board member and an academic with a notable history in civil rights activism in Mississippi USA, also received an Honorary Doctor of Ministry in Religion and Transformational Leadership (Honoris Causa) for distinguished contributions to Africa University and Humanity at large. From Left, Dr. Tsitsi Mayisiwa, Rev. James Waits receive their honorary doctorate degrees during the ceremony. In his opening address, the Vice Chancellor of Africa University, Professor Munashe Furusa expressed profound gratitude for all the love, prayers and faith in Africa University. He gave assurance to the University’s continued commitment in producing young leaders who are a beacon of hope and opportunity. 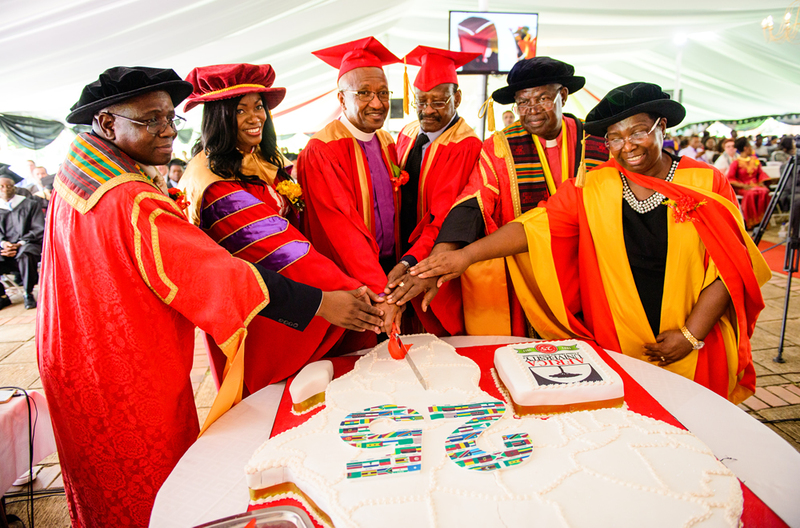 “Our faithfulness, our love, our focused participation in the life and growth of Africa University is our promise to be there for the next quarter century and beyond.” said Professor Furusa. Dr. Tsitsi Masiyiwa who was also the guest of honor and keynote speaker expressed great appreciation for the transformational role that AU has played in Zimbabwe and Africa at large since 1992. Dr. Tsitsi Masiyiwa giving her key note speech at AU's 25th Anniversary Celebrations. “Africa University has come forward and made great strides in training our African people in the skills of mediation, negotiation, managing diversity and most importantly, the concept of Ubuntu, which brings all Africans together as one, regardless of political, religious, racial and ethnic differences. For the past 25 years, this is what Africa University has been standing for, a deliberate effort to create bridges and make Africa the great continent that it should be.” she said. An ecstatic standing ovation was given to Dr. Masiyiwa on sharing her vivid anecdotes of how through God’s mercy, she overcame seemingly impossible trials and tribulation in her life’s journey which she paralleled to the story of Africa University. On this day, Africa University received special gifts from its partners and friends. Bishop Jonathan Keaton (retired) of the Illinois Great Rivers Conference of the United Methodist Church (UMC) made a donation of US$1 million. A US$1 million donation from the Illinois Great Rivers Conference UMC. Another donation of US$1.3 million was presented by Bishop James Swanson, Episcopal Leader of the Mississippi Annual Conference of the United Methodist Church (UMC), USA. A pledge of US$2 million came from Highland Park UMC in Dallas Texas, USA, and was presented by Lisa Tichenor, incoming board member and congregant of the Highland Park UMC. In the spur of the moment, 94 year old Mabel Middleton, made a spontaneous pledge of US$1000.00. Bere Brothers Legal Practitioners, who are legal advisers for Africa University pledged a US$1000.00 for every year AU has been in existence. The total amount pledged by Bere Brothers Legal Practitioners was therefore US$25 000.00. Willdale Bricks made a generous donation of 10 000 bricks towards the construction of a new hall of residence. 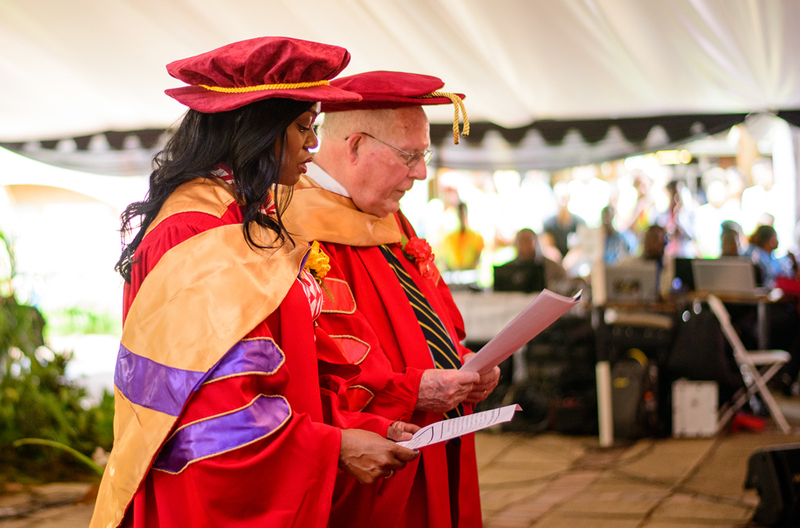 The dream of starting a tertiary institution to educate African children as established by Bishop Joseph Crane Hartzel, elected Missionary for the United Methodist Church to Africa in 1890, was relived at the 25th Anniversary celebrations of Africa University. The anniversary left its miraculous mark in the glorious history of the institution and will forever be a shining symbol of greater blessings for Africa University.